Enter hygge (pronounced “hoo-ga”). It’s a Danish word without a precise analog, but loosely translated as cozy contentment. It’s an important part of the Danish world view — people talk about how hyggeligt it will be to get together, and how hyggelig that get-together was. And it’s the subject of a lifestyle publishing boom. More than 20 books on hygge have been published in the last year, with more to come. “The Little Book of Hygge” was published in the U.S. last month after a successful run in the U.K. It’s been compared to Marie Kondo’s “The Life-Changing Magic of Tidying Up” and the feng shui movement. It was such a hit in Britain that the Oxford dictionaries named hygge one of its top 10 words of 2016, and Pinterest called it one of its top trends for 2017. 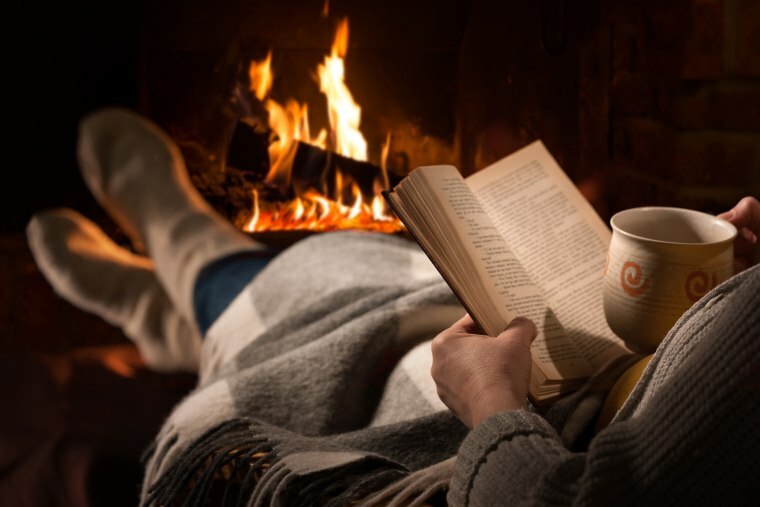 Appropriate to Denmark’s climate (and our winter), hygge is about hunkering down: It’s all candles, blazing fires, warm blankets and fuzzy slippers, reading nooks (called hyggekrog), comfortable pants (hyggebukser), wollen socks (hyggesokker) and tea. Meik Wiking (pronounced “Mike Viking”), CEO of a think tank called The Happiness Research Institute in Copenhagen, describes hygge as “like a warm hug, but without the physical contact.” Wiking, author of “The Little Book of Hygge,” spoke with NBC’s BETTER to explain hygge, the importance of candles and the persistence of Denmark's bleak crime dramas. For those unfamiliar with the concept, how would you explain hygge? I think the shortest label to put on it is “consciously cozy,” or “the art of creating intimacy” or “the pursuit of everyday happiness.” But I think it’s probably best explained with the anecdote that I think also opens the book: I was in Sweden with some friends and we had been out hiking and came back in the cabin and had the fire going and got the stew boiling on the stove and we were just relaxing, kicking back and enjoying silence and each other’s company and one of the guys said, “could this be any more hygge?” And then one of the girls said “yes, if there was a storm outside.” Because it’s also this feeling of being sheltered from the outside. We all have our cozy moments, but what are we Americans missing? We help people with the word find value and help them understand why this is a good thing and not something they should feel guilty about. I think you’re missing the conscious part. … That’s the feedback I’ve been getting from readers in France and Poland and Portugal, where I’ve been — they say “I’ve been doing this all my life. I didn’t know there was a word for it.” And I think that helps people appreciate it more and I think it helps people both plan for it and acknowledge it when they experience it. I think that’s the difference between Danes and a lot of other people, that we have a word that describes that situation, and that makes us more aware of it and perhaps makes us plan for it more and appreciate it more. And then secondly the major difference is that we see it as part of our culture and part of our DNA, the same way Americans see perhaps freedom as part of their culture or DNA. Just as an example, I spoke to a mother of two in France a couple of months ago and she said, “Earlier I would have cuddled up with my two kids on the couch on a Sunday afternoon and we would perhaps have had some treats and tea and I would have called that a lazy afternoon and felt guilty about it. Now I call it having a hygge afternoon and feel good about it.” I thought that was really nice, that we help people with the word find value and help them understand why this is a good thing and not something they should feel guilty about. You study happiness in general and Denmark specifically. People in Denmark have shorter workdays, universal health care, free college education. Given that, does hygge really have anything to do with their happiness? The welfare state is the biggest explanation. That’s why Denmark does well in the happiness rankings — there’s social security, universal health care, equal opportunities for men and women, free university education — all that, of course increases quality of life and happiness. We’ve been looking at Bernie Sanders and thinking, why are you not electing him? It’s interesting that his ideas are considered progressive in the U.S. I think to us, it’s not progressive, it’s just common sense. But the trouble with that explanation was it doesn’t help us understand why Denmark does better than the other Scandanavian or Nordic countries, because Sweden, Finland, Iceland also have the same high levels of welfare, social security and education, all of that. So that’s why we looked at the cultural differences. If you look at Denmark objectively, the weather is awful, the taxes are high, everyone wears black and drinks a lot of coffee. You have these bleak crime dramas. You don’t look that happy. The weather’s not great, that’s a given. We do have summer — it lasts about three hours. Take the high taxes — it’s true we pay some of the highest income taxes in the world, but I think it’s more important to see there’s wide public support for that level of taxation. I think it’s because we feel and experience that we get a lot of return in terms of our high quality of life for that taxation. The dramas: There have been a lot of Nordic noir thrillers out of the Scandanavian countries — I think it’s perhaps because the countries are so safe that people long for some excitement. It seems that candles and lighting are very important to hygge, and I’m not sure it’s something most Americans think about. Can you explain that a bit? We spend a lot of time indoors because of the weather and because we spend a lot of time in the darkness, and lighting is a big thing, so people consider quite carefully how to light a room and you won’t find many big fluorescent harsh white lights in the seating in Denmark. We like these lower ends of the temperature scale that have softer, warmer lights and that comes from having not one big light in the ceiling but several pools of light and that’s also why candles are quite popular because they give off this softer, warmer light. So yeah, that’s a big thing. But it’s a manifestation of the hygge culture, not a driver of the hygge culture. So how do we actively cultivate more hygge? Is it just about noticing what we’re already doing? I think that’s a big part of it. I think it is about something as simple as using the word. I think that makes us more aware of it, and then focus on those ingredients that we talk about in our culture in terms of relaxation and togetherness and comfort and gratitude. I think that’s the best to focus on the values and not on the manifestations – not on the candles, not on the chairs, but the values.